February is here and love is in the air. Are you hoping to create a special Valentine’s Day this year? Surprise your special someone with a romantic evening on your custom deck. Set the mood with the glow of candlelight: arrange tea lights around the deck in votives or mason jars; then place taller candlesticks or pillar candles on the table. Lanterns and jars are convenient to protect the flame on breezy nights, or consider using flameless candles. String lights along the rails of the deck or dangle them above for a warm glow, or add lights to nearby trees and shrubs to create a bit of magic. Luminaires with heart cutouts create a romantic setting. If you’ve added a pergola or have a covered deck, why not hang a chandelier for a special touch? Use a dimmer switch to set the tone. Soft LED or wireless deck lights attached to posts and stairs also add to the atmosphere. Feeling a bit crafty? Frosted globes can be purchased online, filled with white Christmas lights and strategically placed to create that warm, intimate space. What’s Valentine’s Day Without Flowers? Although it’s winter in Southern Wake County, your romance can still bloom on your Valentine’s deck. Place planters of winter herbs like rosemary, thyme, parsley or sage nearby and mix with lights and containers of flowering plants to add color. Cyclamen, baby roses, red amaryllis, and primroses are often found at the store in February. Add a vase of cut flowers to the table. Other local winter plants like Hellebores (Lenten Roses), winter jasmine or winter daphne may be blooming in your yard and can be added to the arrangements. Dwarf conifers work well for North Carolina winter containers-add some white lights or hang paper hearts from these. Feeling like a true romantic? 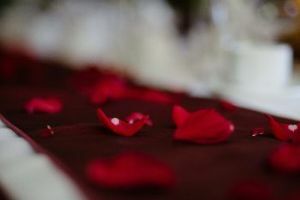 Spread rose petals around the deck and table top. Capture the Valentine’s mood with a playlist of love songs from Pandora, Spotify, or YouTube, or create your own playlist with songs that remind you both of special moments. Use your Echo (if wireless is available) or a Bluetooth speaker and cell phone to provide background music for that intimate conversation or slow dance. The cold February weather in North Carolina can be a challenge for winter deck enjoyment-so cozy it up with comfortable cushions, throws, blankets, and rugs. Think flannel, fleece, wool, or cashmere for a luxurious touch. Do you have room for a romantic hammock for two? What about that hot tub? Consider adding outdoor heating with a firepit, chiminea, portable space heater, or portable heating mat. February breezes can be chilly. Adding a windscreen or curtains to your deck can not only block the wind, but create a private, intimate space. Check out this simple DIY solution for deck curtains: https://southernstateofmindblog.com/diy-floating-outdoor-curtains/. Customizing your deck with a pergola or creating a covered space can provide a cozier environment and a place to hang lights and curtains. Snuggle up! Set the table with fancy linens and a touch of pink and red. Don’t forget that iced bucket of champagne, or maybe you prefer a hot chocolate drink (with Baileys), warm spiced wine or special coffee brew. Sharing a fondue can be a romantic way to start the meal and while you are outdoors, you’ll have access to your grill or outdoor kitchen to throw on the steaks. Look online for a variety of special Valentine’s Day menu ideas. Don’t forget to sprinkle the table with candy hearts and enjoy reading the messages together. No matter your choice of romantic touches, celebrating special occasions on your deck creates special memories. Why not enjoy these year-round? Let us help you to create those memories by building or adding on to your deck, customized for your special times. Call us 919-346-0678.